LISTENING NOTES: Just Another Rumba? 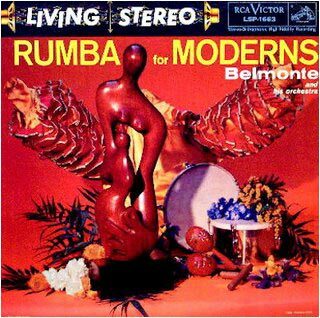 Belmonte's "Rumba for Moderns"
Just Another Rumba? Belmonte's "Rumba for Moderns"
Treasure can turn up in the most unlikely places. Like this title for instance was unearthed with several other choice LSPs last summer when poking around the coastal towns of southern Maine. Of course, stuff like this just doesn't turn up in the obvious places. While driving from flea market to record store to thrift shop, I entered a small town that was having their annual Strawberry Festival. On the lawn of the church (the only one in town) were tables set up with nice old ladies dishing up the best strawberry shortcake you will ever encounter -- a still warm, fresh cooked biscuit, split and layered with mashed and sweetened fresh strawberries, and freshly made whipped cream. No cool whip here! All this for a dollar! How could you top that? Well, you could have a church rummage sale happening at the same time, and while everyone is indulging outside, you are inside the hall, trying to appear nonchalant as you spy a box of records, tucked under a table. "How much are these old records?" I asked. You should always stress the word "old" when referring to records that might be for sale. "A dollar a piece." says the lovely woman behind the table. Gee, I like the pricing in this town! Down on your knees, I find you can conveniently pray for that copy of "Music for Bang, Barroom, and Harp" while flipping through the Lawrence Welk discs, Reader's Digest sets -- and there are a few worth getting -- then what's this? 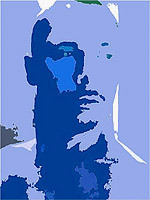 I finger through a group of about five LIVING STEREO titles that I have never had the pleasure of touching before, among them Harry Belafonte's wonderful "Belafonte Sings the Blues", the Ken Nordine narrated stereo sampler "Sounds in Space", Perry Como's "Saturday Night with Mr. C", Perez Prado's "Prez" and the Belmonte and his Orchestra's rarity "Rumba for Moderns". "Oh, those were my husband's, but I just don't have room for them any more. I didn't think anyone had record players these days" I pulled out my five bucks, and muttered that there were still a few of us around, but held back from asking if she might be harboring more of these (or perhaps an old tube amp) at home! Prayers do get answered after all!